Craughwell was on the route at the weekend for a group of runners from Dunleer AC who were running 7 back-to-back marathons (yes, that's seven - one per day for seven days!) from Galway to Dublin and onto Dunleer in Co. Louth. The group are raising funds for SADS (Sudden Adult Death Syndrome), a rare condition that can strike down healthy sports people in their prime and is believed to be related to a rare genetic cardiac defect. The group were welcomed into Craughwell by Michael Tobin who ran with them from Oranmore to Craughwell. They arrived at Craughwell around 11.30am where by the kind permission of Tom Callanan and St Michael's Hall Committee, they had access to shower facilities in St Michael's Hall. They then had lunch in Raftery's courtesy of Craughwell AC Senior Club and relaxed for a while before setting off on the road for Loughrea at 3pm. They were sent on their way from Craughwell by a group of 20 juvenile athletes who ran with them from the hall as far as the Dunard Estate. In fact, the leading bunch of Sinead Gaffney, Brendan Gallagher, Peter Treacy and Padraic Tobin were happily on their way to Loughrea only to be called back as they passed the speed limit signs outside Craughwell. They showed scant regard for the village speed limit also, leaving the marathon runners several hundred metres in their wake! 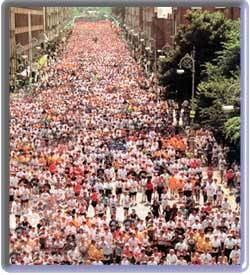 Check out http://www.womensminimarathon.ie for information on 2006 Flora Women's Mini Marathon. 10k race/run/walk, starts at 3pm on Bank Holiday Monday 5th June 2006. Those in the club interested in doing the mini-marathon should contact Nuala Keady as there may be sufficient interest to co-ordinate transport etc. Any man thinking of doing it should consult his GP or psychiatrist before contacting Nuala. Sunday, 5th of March 2006. Ballycotton 10-mile Road race is one of the premier road races in the country, this year attracting over 4300 entries. 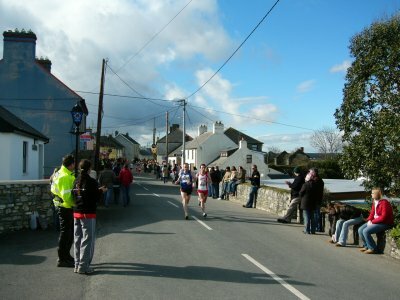 The race is one of the longest running races in Ireland. Yesterday on a cold breezy day, Craughwell posted a very creditible performance with two runners in the top 100. 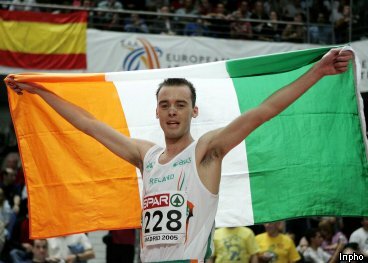 The male race was won in by high flying Raheny Shamrock athlete Vinny Mulvey, the same man who won the inter-clubs cross country last weekend. His time of 49:03 was a relatively slow victory for this course (the record is 47:00) and reflected the breezy conditions. In frosty Moscow, Ireland's finest indoor athletes are competing today against the best in the world. We have fielded a good team, but we will be doing very well to come home with a medal out of this championship. Despite losing out on his lottery funding, Tullamore man James Nolan seems to have really knuckled down since the Olympics (maybe Jerry Keirnan's criticism was a motivator). He will be one to watch, posting superb times this year including a 3K of 7:52 and a 1k of 2:21. He definitely is in with a good chance of making the final, but will be up against it for medals. Unless you've been living in a cave, you will have heard that Derval O'Rourke smashed pb's, national records and all expectations in 7.84 exhillerating seconds in Moscow on Saturday. A fantastic achievement for her - Ireland's only ever sprint world champion. Looking at the race, you could be forgiven for thinking that she had come 4th, so tight was the finish, but the camera doesn't lie and she beat off the competition on the dip. Well done Derval from all at Craughwell AC.